My husband and I just returned from our second honeymoon. 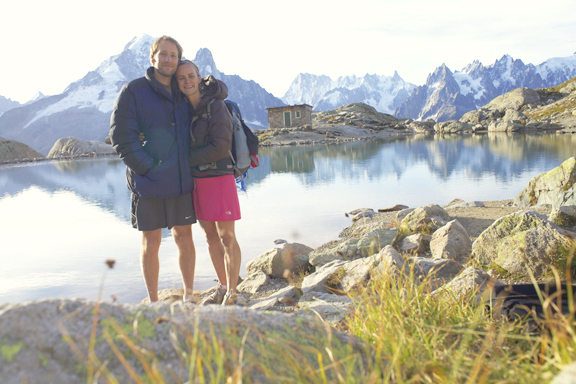 We spent a little over two weeks in Europe, most of which were spent hiking hut-to-hut through the Alps. We were spoiled rotten; we had warm showers every day, multi-course meals every night, and more spectacular views than we could count. I’m now doing my best to catch up on life at home, which includes reading the many, many wonderful posts written by all of you over the past few weeks. Hopefully I’ll get back into the swing of things over the next couple of days. Until then, happy sewing to all! Welcome back! Fantastic you had such a great time. The Alps are gorgeous! Wow, sounds like a fun trip! Glad you guys enjoyed yourselves! Wow – looks like a great place. Just drove my mother-in-law to the airport yesterday who’s spending 3 weeks on a painting tour near Toulouse – I’ve got that travel bug again!!! Great photo – happy honeymooners! what a wonderfultrip! i am happy you had this opportunity!